New York based keyboardist Mike Di Lorenzo has already performed with such artists as Whitney Houston, Gerald Alston, Regina Belle, Bo Diddley, to name only the most popular one. He started his solo career with the highly acclaimed album Urbanized (2005). Rob Young comments in his review: "Producer, composer, keyboardist and production specialist Mike Di Lorenzo has conjured up with Urbanized a near perfect blend of hypnotically fresh grooves that’s coupled with a rapture of sultry and relaxing smooth jazz that’s design for those seeking to discover a new voice called “New York Chill” from his own unwavering musical perspective. 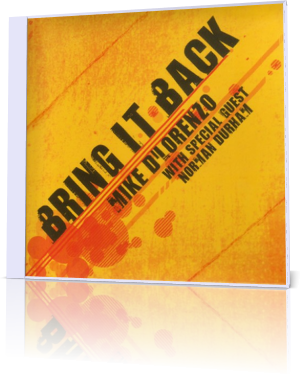 After a long hiatus Mike returns with his sophomore album Bring It Back (2011). Mike describes his album as a soulful, fresh and funky ride through 13 sparkling sides, bringing back a mix of sophisticated funk, groove and soul-jazz productions. On his album he presents Norman Durham, (vocals), Frank Elmo, (tenor sax), Vinnie Cutro (trumpet) and Willy Dalton (guitar). Mike Di Lorenzo had inhaled the Soul over many years. Now he breathes the air of Good Old Time into his unique music. The rendition of Crusaders' Keep That Same Old Feeling features splendid singer Norman Durham. There is some Frankie Beverly in the air. Say Word is a tribute to president Obama and his run for peace and freedom. Earth, Wind and Fire's Can't Hide Love sees a fantastic re-vitalization. Get Loose attracts like a magnet various styles to an irresistible jam. Harold Arlen and Johnny Mercer's song One For My Baby (The Sky's the Limit) became popular with Frank Sinatra's version. Now Di Lorenzo's interpretation featuring Norman Durham and trumpeter Vinnie Cutro surpasses without a doubt all predecessors. Funky like legendary Pick Up The Pieces Mike pulls out all the stops with Bring It Back. On Club Ibiza Mike presents his own view of the pulsating night life in Europe's most popular clubs at the Mediterranean island. When Frank Elmo blows his sax on Sweetness, you will taste and understand this sense of flavor. That's What I Do showcases the great versatility of Mike's band in all musical spectrums. I connect wonderful memories with The Spinner's It's A Shame. Mike's superb arrangement combines west coach guitar and vintage organ with Norman Durham's sweltering vocals. What can be better for a musician than to be busy. Let's Get Busy is Mike's anthem for these in-demand artists. Mo Z presents Vinnie Cutro's outstanding trumpet solo introducing a big bunch of funkiness. With the final track It's Tough In Here Mike diggs out some electronic gags for your ultimate pleasure. Mike Di Lorenzo's creates with Bring It Back his own smooth jazz style that is unique to his sensibilities. He delivers with his funk-filled ideas new musical innovations the format needs so urgently.